This post might be a little bit late but I decided to post it anyway, as some of you may still be able to get your hands on theses treasures. Better late than never, right? July has been a great month to buy magazines with freebies. I love the sample sizes as an opportunity to try products out before committing to the full size. Offering an array of Clinique products, this was the most exciting one for me. 3 New CID Lip & Cheek Tints in Plum Cordial, Strawberry Souffle and Rose Tint or Black Mascara. 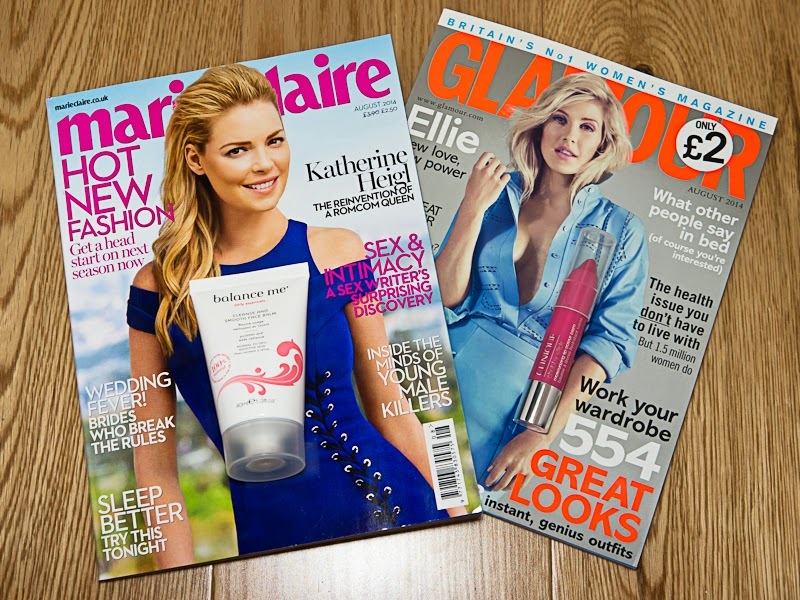 I bought Glamour Magazine with the Chubby Stick in Whoppin' Watermelon and Marie Claire with Balance Me Cleanse and Smooth Balm and I'm absolutely loving both products. Balance Me full size balm is currently priced at £20 for 125ml, so I think £2 for 40ml is a total bargain worth picking up. Unfortunately the Chubby Sticks seem to be sold out pretty much everywhere, as Glamour magazines were released on Monday 7th July. However, the mascara and the moisturiser are still readily available, if you fancy trying those out. The other products also seem to be available in lots of places. If you're having trouble finding them, I suggest having a look at WHSmith, which was where I saw the biggest amount of magazines displayed. Have you managed to grab any of these freebies? Which did you get?